Property 2: Heart of Cawsand, Cornwall's Forgotten Corner, ideal for Family Holidays. Property 11: Bird's Nest is a Fisherman's Cottage in Looe seconds from beach. A Relaxing Getaway One Mile From Sandy Beach At Bantham, Nr. Salcombe, S. Devon. Property 15: A Relaxing Getaway One Mile From Sandy Beach At Bantham, Nr. Salcombe, S. Devon. Delightful two bedroomed lodge in a beautiful, quiet peaceful location. Property 18: Delightful two bedroomed lodge in a beautiful, quiet peaceful location. Property 21: Cottage hideaway with scenic views. Hot tub. Eco-friendly. Property 29: Pet friendly Character Cottage, village setting; walks, short drive to coast. Property 33: Charming coastal cottage - close to beach & coast path. Newly re thatched! Cottage with spectacular views from the terrace - accessible by ferry or boat! Property 38: Cottage with spectacular views from the terrace - accessible by ferry or boat! Property 40: Seagull Cottage - 1 bedroom cottage in Heart of Looe town. Property 45: Detached Cottage,1/4 acre garden. Wonderful views, 3 bedrooms, pet friendly. 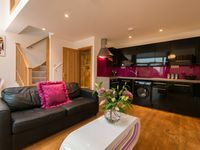 Stylish Beach Cottage Sleeps 4 - 6, just 85 mtrs from sandy 'Blue Flag' beach. Property 47: Stylish Beach Cottage Sleeps 4 - 6, just 85 mtrs from sandy 'Blue Flag' beach.